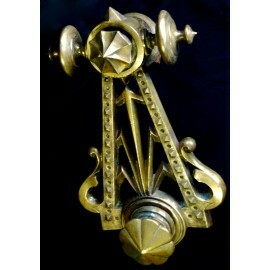 Bronze knocker from the late 19th century 1880-1890, bolts and nut original. Some points of rust but in general good state of conservation. Knocker from the late 19th century 1880-1890, bolts and nut original. MEASUREMENTS: 31 x 17,5 x 17 cm.